I try to resist the urge to find conspiracies behind political developments; I tell myself that politicians and bureaucrats are just too unorganized and divided to really conspire about much of anything. But sometimes that conviction gets tested. Consider this: under our current, very confusing, set of rules for copyright term, at least some published works will begin entering the public domain in 2019. No published works have been rising into the public domain for a long time in the U.S., but a work published in the U.S. in 1923, which had its term extended to 95 years from publication by the 1976 Copyright Act, would enter the public domain on Jan. 1, 2019, since 1923 + 95 equals 2018, and for administrate simplicity, works become PD on the first day of the year after their term expires (hence January 1 is celebrated as Public Domain Day). Many works are protected for even longer, but this is the earliest we could hope to see published works entering the U.S. public domain. And because this date is drawing near, it probably will not surprise many, including those who have always believed that protecting Mickey Mouse lies behind the U.S. term of protection, that Congress is once again beginning the process of formulating a new copyright act. Do we really have any doubts that an extended term will be high on the wish list of the entertainment industry lobbyists? But — and here is the conspiracy part — in case term extension can’t get through Congress, or cannot get through fast enough (the last copyright revision took over 20 years), there is an alternative approach to punitively protecting valuable icons from the mid-twentieth century — the Trans-Pacific Partnership agreement. The TPP, as many readers will know, is a massive free trade agreement being negotiated in secret (more or less) between the U.S and eleven other countries. Included in the TPP is a chapter on intellectual property, and leaks of the text of that chapter have shown us that negotiators are considering binding the 12 parties to a copyright term that might significantly exceed, possibly even double, the minimum requirement under the Berne Convention of life of the author plus 50 years. The longest term being proposed in the TPP, and the negotiators do not seem to have agreed on this point yet, is life plus 100 years. Back in June, Congress renewed so-called fast track authority for the President over trade agreements, so no matter what is in the final version of the TPP, Congress will not get to amend the provisions; they will have to vote either yes or no on the text as it comes from the hands of the negotiators. Obviously this gives a great deal more influence to the lobbyists, who must work only with the very friendly folks from the U.S Trade Representative’s office, not with the splintered and demanding Congress. So perhaps this is a backdoor way to protect Mickey well into the 21st century. We should note, however, that trade agreements are generally not “self-executing,” meaning that they do not become law automatically even once they are ratified. Each nation must still make changes to their own national laws to bring them in line with the negotiated requirements. So if a TPP with a copyright term requirement of life plus 100 years did emerge, Congress would still have to act to make that part of U.S. law. But it would obviously be much easier to get Congress to do so if it were a requirement of a ratified trade agreement; that is great platform on which the lobbyists can stand. Krista Cox from the Association of Research Libraries has done a wonderful analysis of the latest leaked IP chapter from the TPP, which is worth reading by anyone interested in these issues. For me, there are three important points to take away from Krista’s analysis. First, the current version of the IP chapter is an improvement in several ways over what we had seen before. Second, there is still significant cause for concern in two areas — the proposal to make the issue of technological protection measures independent of the underlying copyright rules regarding a work and the issue discussed above — the potential for a much-extended copyright term to emerge from the negotiation. And, finally, there is cause for real disappointment, if not much surprise, at the fact that the U.S. is one of only two countries that is apparently opposing a very innocuous provision that acknowledges the importance of the public domain. With this final point we seem to come full circle. The U.S., for which the public domain is a Constitutionally-required aspect of our copyright law, opposes an acknowledgement of the importance of that gesture to the public interest. How can this be? I am afraid it reminds us again that the folks responsible for copyright policy in our government do not much like the idea that copyright is a bargain with the public. Rather than listening to the Constitution or to the 225 years of experience of copyright in this country, those officials turn their ears exclusively to the needs and concerns of the legacy entertainment and publishing industries. They seem to hear only the siren song of the lobbyist, and indeed, to move freely in and out of the ranks of those lobbyists. Perhaps that is the conspiracy I would rather not believe in, a conspiracy to cut the public, and the public interest, out of their discussions about how copyright should work. Jury instructions are one of those things that few people, not even most lawyers, think about very often. But if you are involved in a trial, they can be vitally important. The ways in which juries are instructed on particular points of law can determine the outcome of a case, so litigants and the lawyers must spend a lot of time arguing over which instruction should be given and how they should be worded. Many appeals revolve around the accuracy and appropriateness of the instructions that were given to a jury. Because they are so important and potentially so contentious, most states develop model jury instructions, or “pattern” instructions, as they are called in North Carolina, for a great many legal doctrines and situations. Access to these pattern instructions is important for litigants. Although their use is not required in North Carolina, using a pattern instruction creates a presumption that the jury was properly instructed. Also, specific variations that a litigant wants a judge to make in an instruction are best proposed as amendments to the pattern. I admit that I have never consulted the North Carolina Pattern Jury Instructions. Nevertheless, I was dismayed to receive this announcement from the North Carolina Bar Association telling me that the free access I had to the Pattern Instructions as a member of the Bar would soon be ending. The story it tells is interesting and instructive. First, the Pattern Jury Instructions are developed by the North Carolina Conference of Superior Court Judges. That is, they are created by state officials as part of their official duties. But unlike documents created by Federal employees, there is a copyright in these instructions, and that copyright has been given to the University of North Carolina School of Government. The SOG, in turn, has given a vendor called CX Corp an exclusive license to distribute the instructions. For over a decade the Bar Association contracted with CX to provide access as a member benefit to NC lawyers, but that contract is expiring and efforts to renew it have failed. A familiar story to librarians, of course, and probably due to the same, familiar reason that most licensing renewals fail — a demand for more money than the licensee feels it can pay. For many North Carolina lawyers, the impact of this new regime will be minimal. Medium and large firms will just factor in the cost and effort of getting an individual subscription to the Pattern Jury Instructions. Presumably the UNC School of Government will realize more revenue from this gifted copyright. But I worry about pro se litigants and those who are represented by solo practitioners or small firms. Those folks might well be at a disadvantage in a crucial phase of a trial, the debate about how the jury will be instructed. They will either have to scrape up the money to purchase a print or electronic version of the pattern instructions, find one of the relatively few public law libraries where they can consult them, or else risk advocating for instructions that will be more easily challenged and undermined. From this unfortunate situation, I want to draw two points that I think are of general relevance to those of us who think about copyright matters. First, it is an important reminder that we cannot assume that public documents intended for a public purpose are necessarily public domain. The familiar provision in U.S. copyright law that puts documents created by the federal government in the public domain is, obviously, only about federal documents. The states can and sometimes do claim copyright in official state documents. They are often used as revenue sources, especially if there is a target audience of professionals, like building contractors or lawyers, from whom payment can be readily expected. The problem with this situation is that the different states take different approaches to what is and is not in the public domain, and also that a single state may be wildly inconsistent about its approach to different types of documents it creates. In most states, most official documents are public domain, at least in the practical sense that they are reasonably accessible without cost. But odd things, like building codes or jury instructions or even an electronic database of the state’s laws, many be exclusively behind a pay wall. The other instructive point in this is the realization that copyrights, especially those held by state and local government, may be used to enact policy goals that have nothing to do with copyright. The purpose of copyright is, explicitly, to incentivize creation. Presumably the NC Conference of Superior Court Judges did not need the promise of royalties in order to compile the Pattern Jury Instructions; creating those instructions was simply a part of good judicial practice for the state. So here we had a copyright that wasn’t doing any work. What can we do with it; how can we use it to make some money? Here’s an idea, let’s give it to the UNC School of Government as an added revenue source! They can exploit it in a way that would be inappropriate for the judges, and the state’s flagship public university can reap the benefit. This isn’t necessarily a bad idea; at least, the purpose is worthwhile. But it is a public policy that copyright was not intended to serve, and it is worth noting that this can happen, and that not all the policies that are supported this way will be equally laudable. In the ideal world, states would be more transparent about what they claim a copyright in and why. And elected representatives should be given the chance to approve, or not, those policy ends that are furthered by the exploitation of copyrights claimed in state documents. At least that way, there would be some accountability when copyright is used for purposes other than that for which it was instituted. While I was preparing this post, I encountered a somewhat parallel story about another legal document — the Bluebook that is the required citation manual for law students, lawyers, and litigants in many U.S. courts. As the blog TechDirt reports, this is another case where access for impoverished litigants may be important, but copyright protection allows access restrictions that impose financial barriers. Of course, unlike the Pattern Jury Instructions, the Bluebook is a privately created document, so there is less confusion about the appropriateness of the initial copyright. Nevertheless, Carl Malamud and his Public Resource allies have mounted a campaign asking that the Bluebook be made more accessible and, as it turns out, finding grounds to challenge the continued existence of a copyright in the work. Fascinating reading. By now, most people know about the macaque monkeys that took pictures of themselves in the Indonesian jungle, and the controversy over who, if anyone, owns a copyright in the resulting pictures. The events actually took place several years ago, but the popular news media has recently picked up the story because of threats by the photographer whose cameras were used, David Slater, to sue Wikipedia if the photographs, which Slater says are his intellectual property, are not taken down. Wikipedia refused his take down request, and the story has gone viral. I know a copyright story has penetrated into popular culture when I am asked about it at home, over the dinner table! There has been so much commentary, including an impassioned defense of the rights of monkey artists, that I am hesitant to wade into the fray. But I think there are some lessons we can learn from both the story and people’s reaction to it; there is an opportunity here to remind ourselves of some basic principles about copyright law. So let my offer two comments about the controversy itself, and two comments about the public reaction to it. First — cards on the table — I am inclined to believe that these photos do not have any copyright protection because they lack any element of human agency. The fundamental principle of copyright law, stated very early in the U.S. law, is that copyright protects “works of authorship.” And although I never really thought the idea would be challenged, I think authorship implies human agency. There must be a spark of creative, a decision to create a work, for something to be a work of authorship, and these photos do not have that. The story has shifted a bit over time, but it does not appear that Mr. Slater gave his cameras to the monkeys deliberately. Even if he did, that could hardly be called a creative decision. He had no control over what they did with the cameras; they were as likely to smash them on the ground as to take pictures. In the well-known Feist decision about the white pages of phone books, the Supreme Court discussed the idea of a work of authorship, and told us that mere hard work — sweat of the brow, as they said — does not by itself earn copyright protection. A work of authorship must be original in the sense of not copied, but it also must have a spark of human creativity. It need not be much, but some human decision is required. By the way, the Feist decision is a roadmap to why Mr. Slater’s arguments about the money and effort that went into his photo-taking trip to Indonesia do not succeed in convincing me that he should have a copyright in these specific photos. His other argument, that the monkeys stood in the shoes of a hired assistant, such that Mr. Slater should own the copyright in these photos as the “employer,” also fails, if it were ever seriously proposed. For one to be an independent contractor, human agency is again required. In U.S. law, there must be an explicit agreement before any copyrighted work created by an contractor could be considered work for hire. And monkeys do not have legal capacity to enter into a contract. This is a legal point; no matter how smart other creatures are or the degree to which humans should recognize animal rights, the law, including copyright and contract, deals with relationships between human beings. Human relations are the foundation of my other legal point about this situation. We need to remember that copyright has a specific incentive purpose; it is designed to reward creators so that they will continue to create. The law grants a government-enforced monopoly so that authors and other creators can make enough money to support their creative efforts. And this justification completely fails when the creator is not a participant in human society. 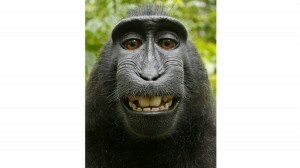 Granting a copyright in a monkey-taken photograph would be a mockery of the incentive purpose of the law. Mr. Slater seems to argue the incentive purpose of copyright when he asserts that it takes a lot of hard work and investment to be a photographer, and only a few of the many photos he takes will make any money. All true, I am sure, but not relevant. This is not a photo that he took, and it does not meet the standard of a work of authorship eligible for the peculiar legal structure we humans call copyright. Many reactions to this story have focused on the idea that it is somehow unfair to deny Mr. Slater profit from the photo. But copyright law is not about fairness, nor does it exist to reward industry or protect an investment. Laws are passed for many purposes, and fairness is often well down on the list of reasons. It is silly to expect to be able to use copyright to leverage some result considered “fair” in every situation that involves an (apparently) creative work. My final observation about the reactions this story has provoked is actually eloquently made by Mike Masnick of TechDirt when he writes about “How that monkey selfie reveals the dangerous belief that every bit of culture must be owned.” It is curious to see how uncomfortable many people are with the idea that no one at all owns these photos; that they are therefore the property of everyone. Perhaps it is the unfortunate influence of the big content industries that makes some people uncomfortable with the idea of the public domain. One of the early articles in this new round of media coverage asked its readers to vote on who owned the copyright in the photo. Most voters split between Mr. Slater and the monkey, with less than 17% being willing to assert that no one owned it, it was in the public domain. And apparently Wikipedia has decided to let the public vote on continuing to make the photo available. It is understandable that the public domain is a source of annoyance and bewilderment to many creators. Their creations often seem like their children, and the expiration of copyright like an act of snatching those children away. My correspondent suggested that more people do not challenge the public domain “because everyone likes free.” But as I hope to suggest in this public answer to the question, the public domain is not free at all; it is purchased at the price of the copyright monopoly. The two things are different sides of the same coin. Were it not for the state-granted exclusive rights in copyright, there would be no need for the public domain. And we can imagine such a social arrangement; I just do not believe that most creators would think of it as an improvement. If you have an apple and I have an apple and we exchange these apples then you and I will still each have one apple. But if you have an idea and I have an idea and we exchanges these ideas, then each of us will have two ideas. Obviously I can sing a favorite song without depriving anyone else of that pleasure, just as books can be printed in multiple copies so that many people can enjoy the same work without disturbing each others’ enjoyment. Only one person can sit in a chair at the same time, however (usually, at least). The other difference is that a chair, as a piece of tangible property, is bought and sold on a basically unregulated market. The chair maker sells her creation to whomever she can find, and once she does so, she surrenders control of it entirely. If another carpenter wants to copy it, he can do so and try to sell his copies. If he charges less, the competition will benefit chair buyers but not chair makers, since it will probably drive prices down. That is simply the chance one takes in a free market. There is a clear relationship between these extra rights we give to copyright holders, that other creators and sellers of goods do not have, and the need for a public domain. Imagine for a minute that we gave similar protection against copying to chair makers. Eventually the ability to make a new chair would evaporate, since all of the possible designs that could serve the chair function would have been done by others, and all new chairs would be infringing. How could we solve this problem? By declaring that after a certain period of time — a period long enough for the chair maker to profit from his creation — older chairs would become free for others to imitate. This “public domain” for chairs would be required to keep up the supply of places to sit, if we decided to grant a state-enforced monopoly in chair design similar to copyright. So the public domain is a required part of a system that allows creators to have monopoly control. It reduces the social cost of the monopoly by allowing less expensive editions of books or songs after that period during which an author or songwriter has the opportunity to make a profit. Remember that a chair maker can profit only once, when she sells the chair she has made. She must keep making chairs if she is to sustain a living. An author, on the other hand is allowed to profit exclusively during his entire lifetime for writing just one book, and even to pass that exclusive right to make a profit on to his children and, probably, grandchildren (based on a copyright term of life of the author plus seventy years). This obviously has a social cost; would J.D. Salenger have written more great novels if he had not been able to make a fortune over the 6o years of his life after Catcher in the Rye from sales of just that one book? The most onerous cost of the copyright monopoly would be this potential reduction in new creativity. The creation of new works depends in so many cases on building upon things that have gone before. Shakespeare copied freely from earlier sources, just as George Harrison copied, albeit unconsciously, when he wrote “My Sweet Lord.” New intellectual property is always created “standing on the shoulders of giants,” and the public domain is a way to ensure that the copyright monopoly does not become a check on new creation rather than the incentive it is supposed to be. This is why the Constitution, in the clause that authorizes Congress to grant a copyright monopoly, stipulates that that monopoly be “for a limited time.” The public domain is a required part of the social and legal system of copyright protection. As I said at the beginning, it is possible to imagine an alternative social system. Suppose we decided that we wanted neither exclusive rights (the copyright monopoly) nor the public domain. Instead, as a society we decided that authors and songwriters should be on the same footing as carpenters and everyone else who created tangible goods; all should compete on an equal footing in a free market. In the short term, this might be good for consumers. Songwriters would have to sell their songs once for the most money they could get, since their ability to make continuing profits over time would diminish. Companies and consumers would then be free to either share the song freely or undercut the sale price of competitors, so it would be easier and cheaper to obtain music, and the threat of litigation over sharing would vanish. In the long term term, it is hard to say whether this would be beneficial or harmful. The conventional wisdom is that creators would stop creating because they could not make a living. But maybe they would become more like carpenters, depending for continuing income on continuous creation. If that happened, society would benefit from more creation instead of less. As for the public domain, without the exclusive rights in copyright, society would not suffer the same costs and therefore would not need the same bargain that results in the public domain. And creators would be in the same situation, again, as chair makers; they could enjoy their creation in perpetuity, as long as they decided not to sell it. But, like the chair, once the song was sold it would be beyond the creators control forever. I doubt that this scenario appeals to many creators. But I hope it helps illustrate why copyright and the public domain are inseparable concepts; they go together, as the old song says, like love and marriage. January 1st of each year is celebrated by the geeky few who track such things as “Public Domain Day.” That is because the works whose copyrights expired in the previous year officially enter the public domain, through a convention adopted into the copyright laws of most nations, on January 1 of the following year. Thus, on January 1, 2014, works written by authors who died in 1943 (2013 minus 70) should enter the public domain, and do so in most countries. Thus this year should be the beginning of free public use of works written by Robert Frost, C.S. Lewis, Sylvia Plath, W.E.B. DuBois and many others*. Unfortunately, the various ways in which Congress revised our copyright law in the U.S. have created a ridiculous anomaly — no published works enter the public domain at all here in America until 2019 (assuming the law is not tinkered with again). That is because under the 1976 Copyright Act, which took effect on January 1, 1978, all works that were already subject to copyright protection at that time, which was any published work that had been published, with copyright notice, after 1922 (1978 minus 56, which was the previous maximum copyright term), were simply given a 95 year term of protection. Thus, in the U.S., no copyrights will expire for published works before January 1, 2019, when works published in 1923 will become PD. So while many works of authors who died in 1943 became PD in other countries, in the U.S. only unpublished works by such authors rose into the public domain. Those unpublished works are subject to the general life plus 70 term of the current U.S. copyright law, even though works published prior to 1978 are not. That is the situation as it is, and you can read more about it on this page from Duke’s Center for the Study of the Public Domain, as well as this post on the TechDirt site. To explore even more fully what might have been, the Center for the Study of the Public Domain also provides us with details about what could have been in the U.S. public domain if we had preserved the 56-year maximum term of protection that was the law prior to 1978. Under that rule, works published in 1956 would be entering the public domain this year, including books by Jack Kerouac, Ayn Rand, Samuel Beckett and, my personal favorite, Margaret and H.A. Rey (if you don’t recognize this pair, think about an inquisitive monkey). This year, we also received a timely reminder that the public domain is not as automatic as we might think; it requires attention if it is to flourish and be preserved. On December 23, 2013, a judge in the District Court for the Northern District of Illinois issued a ruling that confirmed the fact that Sherlock Holmes (another favorite literary character of mine) is in the public domain. Arthur Conan Doyle wrote four Sherlock Holmes novels and fifty-six short stories. All but ten of the stories were published prior to 1923. Nevertheless, the Conan Doyle Estate, Ltd. has continued to demand that anyone using the Sherlock Holmes character, as many authors wish to do, pay for a license. When author Leslie Klinger and his publishers got such a demand, Klinger filed a lawsuit seek a declaratory judgment from the District Court that Sherlock belong to all of us. The Conan Doyle estate argued that the Holmes character continued to evolve and develop right up through the last story, so that the character itself would not enter the public domain until that final story, published in 1927, does (which would be January 1, 2023). Judge Ruben Castillo of the District Court in Chicago ruled, following substantial precedents, that the character of Sherlock Holmes, as he has been delineated in the four novels and 46 stories that clearly are PD, is also “free as the air for everyone to use.” Only elements of the character that were added anew in those last 10 stories, elements such as Dr. Watson’s second marriage and Holmes’ retirement from his practice as a consulting detective, are still subject to protection. But, according to Judge Castillo, all of the “Pre-1923 Story Elements,” which are more than sufficient for new authors to create stories featuring Holmes, are in the public domain. He rejected the argument from the Conan Doyle Estate that Holmes was such a complex character that the earlier precedents, involving, they said, “flatter” and less richly delineated characters, should not apply. Such a rule, Judge Castillo pointed out, is to nebulous and difficult to apply; he decided to stick with the “increments of expression” rule about which aspects of a character are protected once some stories about that figure rise into the public domain. So as we reflect on what is the situation regarding the public domain in the U.S., and what might have been, it is also important to recall what needs to be done. There are lots of interested parties out there, like the Conan Doyle Estate, that will keep trying to sell that which should be free. Just because someone offers, or even demands, a licensing transaction does not mean that such a transaction is required. Users, including new creators who are building on work that has gone before (as all do) need to be vigilant and protect their rights, as Mr. Klinger decided to do. We can easily fall into a false but happy belief that the public domain is automatic, a self-executing realm of free stuff. But it is not; it requires attention and often direct action to ensure that our shared culture is fairly available to all without the extra-legal rules and fees that many would apply to narrow the scope of the public domain for the purpose of private gain. For more detail about the public domain, legal regimes that have impoverished it, and pro-active efforts to protect and expand the canon of works freely available to the public, reading this article by Jennifer Jenkins, Director of Duke’s Center for the Study of the Public Domain, is a great way to cap one’s observance of Public Domain Day. September 27, 2013 Kevin Smith, J.D. It is well known that early publishing houses in America built themselves up, in large part, through the publication of unauthorized editions of popular British authors. This was a time when foreign works, including English-language books published in Britain, did not enjoy copyright protection in the U.S. Indeed, books published abroad in English did not get copyright in this country until 1891, a full century after the first U.S. copyright law. And even after that time, the strict formalities imposed on foreign works, including the infamous “manufacturing clause,” kept many works out of copyright. American publishers used this legal situation to make money off of the popularity of British authors without having to pay any royalties to those authors. The firm Harper published unauthorized editions of Walter Scott, for instance, while Grossett & Dunlap (now part of Penguin) built its business in part by publishing Rudyard Kipling without his permission. British authors and British publishers called this activity “piracy,” but in the U.S. there was a different name for it. It was the public domain. In his new book Without Copyrights: Piracy, Publishing and the Public Domain (Oxford University Press, 2013), law professor (and one-time professor of English Literature) Robert Spoo details the legal and the literary situation that modernist British authors faced because of the narrowness of American copyright or, alternately, the expansiveness of the American public domain. Just to take one example, Virginia Woolf’s early novels were published in the U.S with substantial changes from their U.K. editions, because it was believed that revised American editions could get U.S. copyright even if the original edition had failed to meet the manufacturing requirements. Woolf instructed her friend Lytton Strachey, for example, to make lots of revisions because her American publisher suggested “the more alterations the better — because of copyright” (Spoo, p. 95). Joyce and Pound were both published in fragmentary format in magazines because of the (unproven) theory that such publication could stake out a copyright claim while avoiding the difficulties and expense of U.S. printing and binding. It is fascinating, in my opinion, to see how the actual experience of literature was shaped for American readers by the strictures of the copyright law. Then, as now, accusations of piracy were thrown about rather irresponsibly, and Drone sought to clarify the situation. Over time, publishers developed a system called “courtesy of the trade” which took the place of copyright protection for foreign authors. That system had two prongs — the offer of some form of payment to the foreign author of a reprinted work and a “gentleman’s agreement” amongst U.S. publishers that others would not “jump the claim” of a publisher who had announced the intention to reprint a specific author. Although this was referred to as courtesy, it was really sharp business tactics, and it was not particularly fair to the authors. They were not in a strong negotiating position as to the fees they were paid; they pretty much had to “take it or leave it,” especially since the system made it very difficult to shop their work to multiple American publishers. And, of course, the system was used to create informal monopolies, which excluded competition and drove up prices. In some ways the system of trade courtesy reminds me of the current situation for academic publishing. Although lip-service is paid to the rights of scholarly authors by publishers, their work is appropriated without payment through a coercive system in which they had little option, until recently. Such publication is not piracy, as Drone tells us, but it certainly is a form of free-riding, coupled with an effective monopoly that keeps prices on the sales side artificially high. In the context of this confusion, it is all the more laudable that some groups are making continuing contributions to the public domain. I began reading Spoo’s book shortly after returning from a meeting about the Copyright Research Management System that is an ongoing project of the HathiTrust. CRMS is methodically researching books that fall into the “doubtful” categories of U.S. copyright — periods of years during which a published work might still be protected or might be in the public domain. Since the beginning of the U.S. project in 2008, nearly 150,000 titles have been identified as public domain. These are works that can be made available to the public without any harm to rights holders. There is nothing underhanded about this project, as there arguably was about unauthorized reprinting by American publishers of unprotected foreign works. Instead, this research provides a pure benefit. Most of that benefit is in the ability to open up new works to the public that were previously closed simply due to lack of data. Another part of the benefit, however, is in the fact that information is being gathered that is beneficial to rights holders and to future users. As it determines that many books are in the public domain, the CRMS project has also determined that a significant number of the books it has researched are still in copyright, which is important information to know. Even the fairly large category of “undetermined” is beneficial. Although these books are not able to be opened to the public domain, there is now better data about these titles and the gaps in our knowledge about them have been identified. Knowing what we don’t know, to paraphrase Don Rumsfeld, is itself a step forward. HathiTrust should be proud of the work that it has done and continues to do, opening books to the public domain and gathering data that will clarify the contours of the public domain into the future. The public domain is a changeable space, as Robert Spoo shows eloquently in Without Copyrights. Changes in law, changes in the practices of authorship and publishing and even the cost of paper can influence what is, or is not a public domain resource. As with the weather, many people complain about the vagaries of the public domain, but do nothing about them. Spoo and the HathiTrust are each, in very different ways, doing something to strengthen our notions about those resources that are the vital common property of us all. One type of question that I get over and over again from faculty and graduate students involves copyright and images of art works held in museums. In fact, question is probably the wrong name for these discussions; mostly I try to be sympathetic as the researcher bemoans the thicket of claims and permission costs in which they have become entangled as they undertake some project. I recently met with one faculty member who is creating an amazing “digital humanities” project and needs to obtain, from a significant number of different museums, high-res images of works that are clearly in the public domain. Even this author, who is both remarkably good-humored and very persistent, was confused and bemused by the Pandora’s box she had opened. Then I saw this article about the Rijsmuseum in Amsterdam, which reminded me that even in Pandora’s box, hope remained in the bottom — some museums are bucking the trend and creating reuse-friendly policies for images of public domain works. Many of the artworks held by museums around the world are in the public domain, either because they were created before copyright came into existence in the late 17th and early 18th centuries or because any copyright they had has expired. And even for works that are still protected by copyright, most often the museum that owns the art work does not also hold the copyright. Even a photograph or digital scan of a public domain artwork that is created by the museum may lack copyright protection under a U.S. District Court decision that said that such “slavish” reproductions — reproductions that add nothing but attempt *just* to accurately reproduce the work — are not original enough to gain any copyright other than whatever protection the underlying work enjoys (which, if the work is public domain, is none). This is only a District Court case, but it has never been appealed or, to my knowledge, otherwise challenged so it probably should guide us unless or until we get something more definitive. Museum claims over the use and reuse of images from their collection, even though often called and often understood as copyright claims, are really mostly a matter of contractual agreement and simple control over access to the unique works that the museum holds. Because these works are (more or less) unique, the ability to make a reproduction can be tightly controlled and the museum can impose contractual conditions on access to make such a reproduction or on the reuse of a museum-supplied image. These contractual obligations actually bind only the parties that agree to them, but in practice they are often passed to downstream users in the form of conditions on reuse that the original recipient feels bound to impose. All of this is explained very elegantly and discussed in great detail in a superb article written on the topic by Kenneth Crews of Columbia University, which is available here. It is a subject all librarians, in my opinion, should understand, so the article deserves a wide readership. Dr. Crews points out both that many claims made by museums tend to stretch the copyright law beyond reasonable bounds AND that some of the claims for control and remuneration are supported by sound business practices and cultural policy considerations. This is not a black or white issue, just one where more clarity and an open discussion of genuine needs and concerns can lead to better conditions for the reuse of artworks and images. If they want to have a Vermeer on their toilet paper, I’d rather have a high-quality image of Vermeer on toilet paper than a very bad reproduction. Maybe the example chosen is not one involving high culture, but it illustrates quite dramatically that reuse of public domain art is inevitable, even for purposes we may deplore, and that the public is, in many cases, better served by access to good-quality reproductions than it is by complex contractual terms and absurd restrictions on even the most traditional practices (like sketching an artwork at the Art Institute of Chicago). If we must chose between extremes, there is a great deal to recommend the Rijsmuseum approach. As libraries, museums and archives work to digitize more and more of the public domain materials that they hold, it is worth considering how others will be able to use and reuse those images. With so many digital humanities projects being pursued around the world, the thickets of permissions and use restrictions will grow evermore burdensome. An example like the Rijsmuseum is a great counterweight to that burden, and a graphic reminder that it really does not have to be that way. Of course, not every cultural institution can afford to make high-res reproductions available for free; fees are often essential to support the mission-driven activities of these collections. So fees may be needed for the provision of high-res images, as may some restrictions on further dissemination of those images. But many of the restrictions and fees we often encounter cannot be justified in this way. So if we start from the very open policy of the Rijsmuseum and then apply only those restrictions that have sound, policy-based foundations, we can arrive at much more supportive approaches to reuse and new creativity. The policy adopted by the Cornell University Library’s digital collections is, in my opinion, a model of such a moderate and sensible approach. For those beginning to explore the uncharted territory of the digital humanities, permission fees and reuse restrictions will probably continue to create nearly unnavigable thickets of complication. But with these few counter-examples, we can see that a better approach is possible. Libraries and the digital archives associated with them need to model the best practices that we can in hopes that the most absurd kinds of copyright overreaching will become less common and rational policies based on an accurate assertion of rights and a realistic assessment of needs will begin to dominate. April 18, 2012 Kevin Smith, J.D. The conference on Orphan Works & Mass Digitization, hosted by the Law School at the University of California, Berkeley last week, was exciting — at least to the 230 copyright geeks like me who attended — and filled with well-researched papers. The three White Papers that were prepared by the Samuelson Law, Technology & Public Policy Clinic (written by former Duke Scholarly Communications Intern David Hansen) are well worth reading. In this first post I want to look at a basic terminological issue and then focus on two general observations from the event. In a subsequent post I will describe three specific suggestions made by conference speakers for solving the orphan works problem. The end of the registration requirement, which now makes locating rights holders so much more difficult. The combined effect of these changes to U.S. copyright law, all accomplished between 1978 and 1989, has been to create a huge class of orphan works. So it is not surprising that many of the suggestions for how to deal with the problem pushed toward reversing or mitigating some of these changes. Registries, for example, were a common theme; under these various proposals to create registries to assist in finding copyright holders for different types of works, we would simply be recreating (hopefully more efficiently) the registration database of the Copyright Office, which once could claim mandated comprehensiveness but unfortunately can do so no longer. The first observation from the conference is that nearly all of the speakers (except the industry representatives and Registrar of Copyright Maria Pallante) seemed to think that legislation to solve orphan works is probably impossible and likely a bad idea. The political climate in Washington makes attention to copyright issues unpalatable, and the proposal we saw several years ago was unattractive to many of the speakers. Instead of newly created legislative schemes, potentially with burdensome and impractical requirements, many of the speakers looked for small changes that could be accomplished either in common law – by action of the courts, that is – or by simple legislative amendments to portion of the law as it currently stands. In our next post we will examine some of these more modest suggestions. Closely related to this distrust of the legislative process as a path for solving orphan works was a clear distaste, again expressed by multiple speakers, for solutions that would create a regime of extended collective licensing (ECL). Such ECL programs would, of course, require a complex legislative enactment, and examples where such programs are in place were widely considered failures on a practical level; a professor from Canada, which has such a plan, was especially clear that this is not a workable option. On the level of policy, an ECL scheme, where potential users of orphan works apply to some government-authorized board for permission and pay a fee, was denounced as economically inefficient. The purpose of legislative licensing schemes is to facilitate the transactions so that users can find owners and owners benefit from the uses. With orphan works, of course, there is no owner to be found so no transaction like this is actually facilitated. Instead, the fee that would be paid to some collective organization would amount simply to a tax on use, with no economic benefit or incentive for creators at all. One speaker refer to this sort of approach as similar to the medieval practice of selling indulgences, based on a dogmatic conviction that all unauthorized uses are a form of “sin.” Any program based on such a foundation, rather than on solid economics, incentives for creation and cultural development, would be bad policy from the copyright point of view.